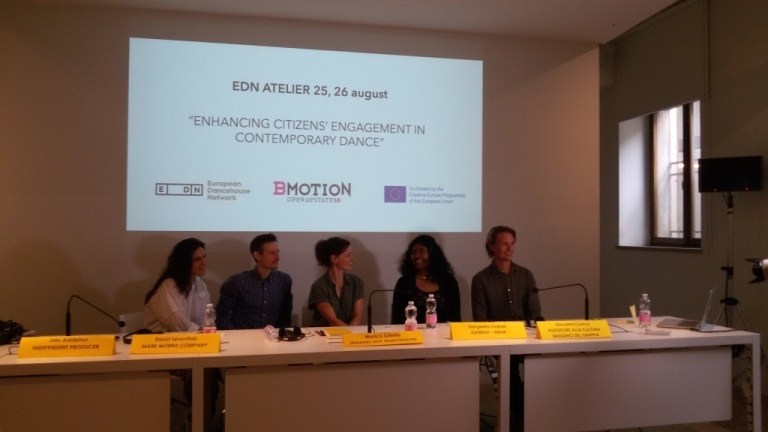 “Enhancing citizen’s engagement in contemporary dance”. It is hard not to think of the clear and concise power of Nietzsche after having experienced the second day of this international EDN (European Dancehouse Network) conference. These enigmatic words of his might be the perfect rubric through which to summarise and opine upon this morning, so replete in discourse and declarations. It was inaugurated by an unorthodox yet very eloquent dance class, presented by some of the guest speakers. 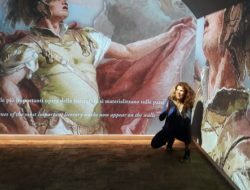 Perhaps it was no coincidence that the symposium took place in the Civic Museum, accessed by passing right in front of one of the most eccentric and heterodox medieval frescos in the history of art. Here the Holy Spirit is not depicted as a ray of light or dove but as a child’s body. Indeed, the flesh and blood of a human being, a physical body and thus also a potentially dancing being was decidedly at the heart of the meeting. “Dance — that is the great salvation from suffering” could have been the second day’s apt title. Notwithstanding, the actual words “salvation” or “suffering” had never been uttered during the symposium. 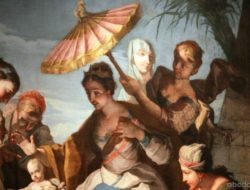 But the speakers’ presentations and talks all seemed to irredeemably converge: dance as an artistic form which is intrinsically capable of alleviating and healing wounds, both psychological and physical, and to restore relationships, to revive joy and renew confidence in oneself and others. “Dance is an inalienable human right” asserts David Leventhal. And in this definition we can encompass all the regenerative power of dance, that which allows people to imagine and feel; to experiment with a profundity of listening, not only of oneself but, above all, the other. Moreover, it kindles that sublime feeling of empathy, a response which the American economist and sociologist Jeremy Rifkin identified as the keystone that could “redeem” the whole world from catastrophe. 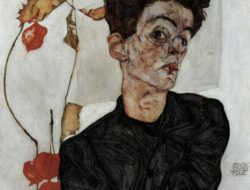 In his words (The Age of Empathy, 2009): “The most important question facing humanity is this: can we reach global empathy in time to avoid the collapse of civilization and save the Earth?”. The round table exchanges by the speakers were testament enough of the far and wide dissemination of dance. Beyond theatres and such centres of tradition, in remote and little known areas of the globe, with projects and activities that have developed out of sometimes profane and non-professional beginnings, connecting semi-known choreographers and dancers in international networks, successfully encouraging young people, children and adults who are particularly fragile towards the art of dance. To moderate the debate we have Monica Gillette, an artist, choreographer, a dramaturgist and project developer, who today adopts the role of “conversation starter”. The guest speakers are Sangeeta Isvaran, founder of the Wind Dancers Trust, a dancer-performer who developed the Katradi method, working in marginalised, underprivileged communities, utilising the arts in education, empowerment and conflict resolution across 30 countries; David Leventhal, former dancer of the Mark Morris Dance Group (1997–2010), currently Program Director and one of the founding teachers of MMDG’s Dance for PD® program, which offers weekly classes for people with Parkinson’s disease throughout New York City; Jala Adolphus, an independent producer based in Jakarta, Indonesia and also editor of the online magazine Tanzconnexions; Giovanni Cunico, Councillor for Culture, Bassano del Grappa Municipality. Informing the orientation of this irregular conversation, commencing with the morning dance classes conducted by some of the speakers, were issues and allied keywords such as: “community dance”, “ecosystem”, “sustainability and legacy of projects”, “barriers”, “sense of belonging”, “marginality”, “gatekeepers”, “paradigm shift”. Sangeeta Isvaran gifted us with an experiment on synesthesia during her dance class which took place in the evocative open air space of the Civic Museum’s Cloister. Firstly, after welcoming us, she bid us one-by-one to offer up a wrist for anointing. She then brushed it with a segment of freshly-peeled orange. By way of this initial gesture she made everyone feel at home, in a safe place. Secondly, Sangeeta asked us to remove our shoes and go barefoot, leaving our soles to be prickled by the Cloister’s short strands of cut grass, thereby reconnecting our bodies with the sense of touch. Finally, she began to dance, sharing some gestures of her archetypal and ancestral dance with us; evoking deer, elephants and fish of the sea, Krishna and his brides. Looking skyward, yet with her feet firmly on the ground, Sangeeta then sang us her song, her dance and her basic glossary, composed of words like “love”, “acceptance”, “circularity”, “gratitude”. Through her face and hands we could glimpse the full wisdom of the ancients, symbolic gestures, a mime that is capable of narrating tales or entire mythologies, a voice that is in contact with something divine and celestial. Its effect on the mind and body, hitherto tired and apprehensive, was one of great calm and tranquility, both physically and inwardly. Dance as communal dance overlaps and also defines the pioneering work of David Leventhal, director of the Dance for PD program. With well-balanced enthusiasm, David told us about this adventure, how it was successfully exported to half the world, yet all grew bottom-up via citizen initiatives. “We started in Brooklyn in 2001 and then the program become a model. 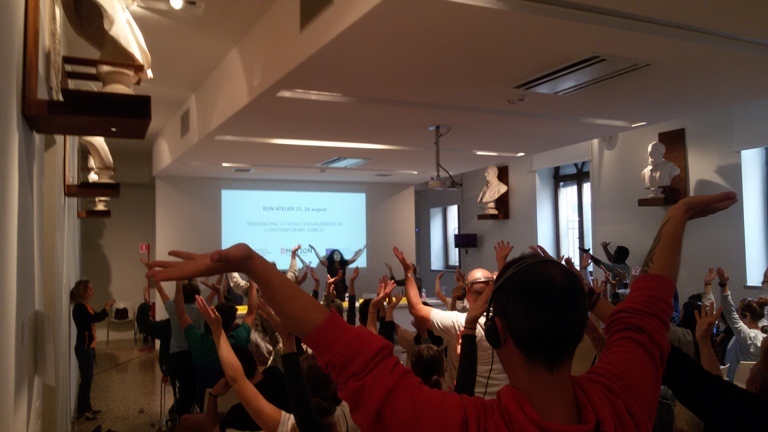 Today the program is in 25 countries, so we spend a lot of time now in supporting and fostering innovation and training and teaching artists to continue the work, to continue the legacy and to expand it with new ideas. […] The Mark Morris Dance Group was an itinerant dance company along with many other New York companies […] until 2001 when we opened at a dance centre in a part of Brooklyn that was being redeveloped as an art district. When we opened at that building we felt strongly that it wouldn’t only be a dance centre but a community centre too, whose currency is dance. We made that very clear in our introduction to the community course. We opened our doors to the community. We didn’t exactly know who that might be! We hadn’t done any market research, we hadn’t done focus groups, we hadn’t done any statistical analyses of who our neighbours were. Instead, we sent a message: ‘We are here and our door is open’. One of the first to come was Olie Westheimer, leader in supporting people with Parkinson’s in Brooklyn. Olie had a dance background. She was intrigued by the idea of what community meant set against how a professional dance organisation like the Mark Morris Group could work and collaborate with her, to develop a program that was not a water-down version of therapy, not a clinical experience, it was not even about Parkinson’s. It was about creating a social space and a creative space for people with Parkinson’s to do dance. One: to step away for their disease, to escape from it for an hour a week. Two: to understand and incorporate the strategies and approaches that dancers use to create, explore and execute movements of all sorts. So, it was a double assault: it was an escape from medicalisation but also a very practical lab for understanding what a dancer could do and how might that information be made available to us. 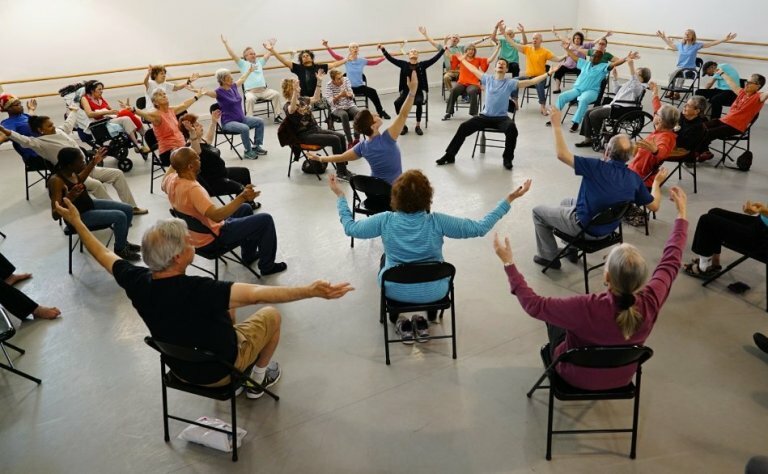 The dance centre was a space for conversation where these two communities who were so divergent — dancers and people with Parkinson’s — could come together and start to exchange information and support each other. So, that space was a community space where the currency and the vocabulary was about dance”. Likewise the councillor Giovanni Cunico has borne witness to a contiguous and equally successful project, that of Dance Well. David Leventhal has himself praised the venture as an example of a virtuous long-term project, one that has made social inclusion its core mission. “I think it’s very important — Cunico says — to have places in this town where you can experiment and feel good. These spaces should not only be related to welfare policies, such as nursing homes or hospitals, but also to places of beauty and culture like this Civic Museum. In this setting […] something different happens, because here we have brought together many citizens and ‘the marginalised’. Within this space we have managed to induce languages able to overcome the barriers that exclude these citizens from our cultural community and civic society. So far, thanks to culture, we have managed to be inclusive. We have ‘knocked down’ the boundaries between welfare and culture here in Bassano. 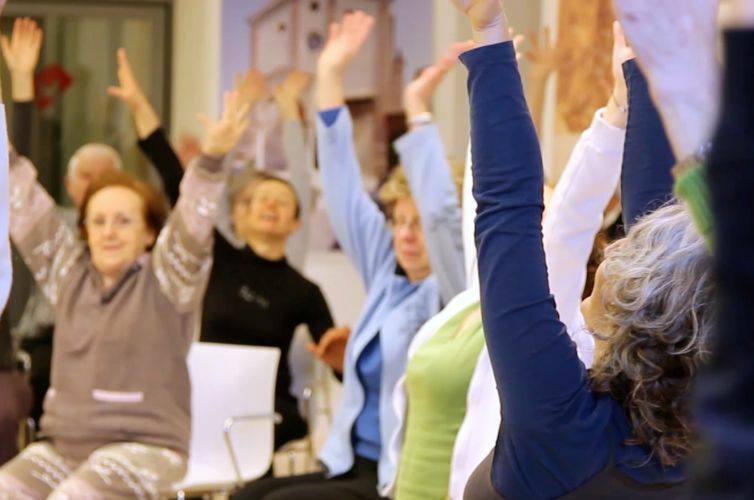 The Dance Well group is a community of people that has become remarkably influential, because it is no longer just about dance or Parkinson’s. Participation in the classes has been further extended to embrace local youth, the elderly and immigrants. The Dance Well project has become a formidable key in unlocking and opening up our community”. Jala Adolphus shared with the audience her experience of one of her most successful projects, created in collaboration with the Indonesian dancer and choreographer Eko Supriyanto. The latter came into contact with her during a reconciliation project which was set up in a remote region of Southeast Asia, a community stained by bloody conflicts in the late 1990s and early 2000s. “All of the youth from the age of twelve had completely lost their link to their own local cultural practice — relates Jala —“Their culture completely disappeared due to these conflicts. […] Eko worked on a reconciliation program which involved 400 kids over the space of a year […] and through it he developed a deep connection to the local families and to their kids… Each of these kids had lived through a huge drama… Someone had seen all of his family executed. From this experience he started working with seven young boys and he had no idea what to do and there was no funding, no money, but there was a space to rehearse and from this started a group piece called Cry Jailolo, which premiered and it is going to tour internationally across a huge number of European venues, Australian venues, Indonesian venues… […] These kids, these boys and these ancient dances were suddenly experienced in parts of the world where they never had access to. They were performing their own culture, their own vocabulary. They did relearn their own history and they were performing it with this folkloric dance piece in international venues”. One of the fundamental questions raised by the moderator to the speakers concerns the definition of audience and spectator, of citizen and artist. Their elaborated answers suggested a radical paradigm shift and a reversal of perspectives. Through a touching story, Sangeeta Isvaran quizzed us about the meaning of the words ‘artist’ and ‘spectator’. “There was a Cambodian girl who, unfortunately, is now no more. She died of HIV when she was twelve years old. She was a victim of sexual abuse. She wrote poetry in Khmer which was her mother tongue. She said: ‘I am a bud, just about to flower, don’t crush me into this earth. I am a bird just about to fly, don’t cut off my wings. I am the secret instrument of the Goddess, don’t touch me, you do not have the right. My heart is free in the sky, don’t imprison it’. Some of you worked with that phrase in the class I did the last week. Everything in that poetry is so powerful and has so much to tell. So, is she the artist? Is she the spectator? Is she a citizen? Is she even allowed in most of the spaces like this one to express herself? I want to share her story. I want her to continue in this river that we call life”. The theoretical, artistic and spiritual foundation of her dance is what they call rasa in India. Rasa is an ancient philosophy and aesthetics, literally meaning flavour. Rasa is a connection to the universe, to others, to oneself. 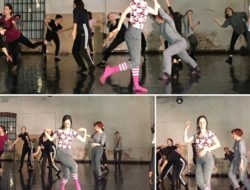 “You can have the most beautiful costumes, the greatest musicians, you can be very beautiful, the best, but if you do not give one moment when you can connect with rasa, you can give up dancing” she loved to repeat to her own dance teacher. “Rasa — explains Sangeeta — infuses the practice of sharing art and dissolves the barriers between those who are watching and those being watched. Who is experiencing? All of us are experiencing”. The attempt to distinguish between different categories of citizen and artist is misleading, as David Leventhal points out with provocative conviction: “We have tried to make a distinction between citizen and artist but actually, the citizen is the artist, the artist is citizen. […] Instead of trying to figure how to get artists who can create a program for citizens, we have to remind artists that actually the citizens are also artists”. When asked about the barriers and obstacles encountered so far, David Leventhal chooses to respond by alluding to an original show, it was staged during this edition of B.Motion Dance 2018: And my heart almost stood still by Ari Teperberg. The show was inspired by a letter written by the deaf and blind activist Helen Keller about Beethoven’s Ninth Symphony, performed in 1914 by the New York Symphony Orchestra at Carnegie Hall and composed by Beethoven when he himself had already become deaf. 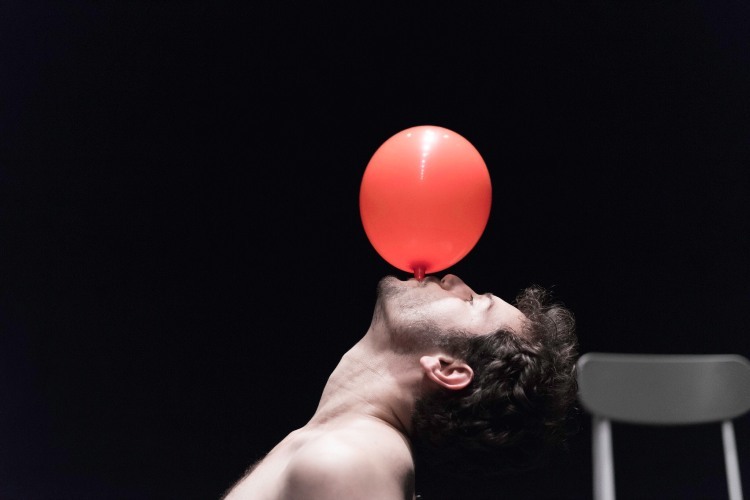 During his performance, Teperberg uses red balloons, inflating and deflating them several times and which, in the end, are launched into the audience. The house-lights go out, the audience remains completely in the dark while Beethoven’s Ninth continues to thrum at the highest volume throughout the hall. The audience feels it like an electric shock: suddenly one can hear the music as Helen Keller felt it: through the hands, through the body, through touch, through the heart’s pulse, through the red membrane of those balloons. “I guess, the question is what is the red balloon in Teperberg’s piece? The red balloon is a way of transposing the information that is coming from the sound waves, into physicalisation, into movement. We feel the music in that balloon we are holding in our hands”. The Dance for PD program is somehow like those red balloons, because it manages to spur individuals with objective physical impediments to dance. But there is another type of barrier to be tackled according to David: the cultural one. 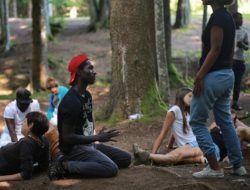 “Unfortunately, in Europe and In North America there is a sense that dance is the exclusive right of a few, who are physically able, economically available, who have access to dance training. […] Dance is for anybody. Dance is for any body. We are all dancing bodies, we are all dancers. […] We need to explain why dancing is everybody’s right and to break down the barriers that are perceived around that word ‘dance’. That’s one barrier I’ve met”. “I felt that many voices were missing” — recounts Jala Adolphus, expounding upon what motivated her to take up her work. “I’m Australian. I spent my childhood growing up between Indonesia and Australia and the reason why I’m going on with this work is that I didn’t see any contemporary work from the Asian region in Australia, as a child or when I was studying. I also spent a lot of time in Europe in my twenties and […] I thought that there were ‘gatekeepers’ that were not reflecting the society or the region we were living in. That’s why I want to work in the South-East Asian region. And I think this notion of gatekeepers is something I’m very conscious of myself as an independent producer”. The morning culminated with a concern raised by David Leventhal: “Dance is the most ephemeral art form, it evaporates before we even know it happens, sometimes. […] In this art form of ephemerality how do we make our work have a legacy, how do we sustain it?”. The answer undoubtedly lies in the good practices that all the speakers had attested to in this hall, practices that they will continue to promote and carry forward.